Just over a week ago myself and Izzy embarked on a little adventure to York for the day to visit The York Dungeon. What could've been a very easy and exciting trip for me and my friend actually turned out to be pretty difficult because we made the bad choice to go out the night before. Bad humans. So the first disaster happened when I woke up at 9:15am and looked at my phone. I was definitely still drunk, quickly wrote a message to my mates to let them know I'm alive and then realised after a good 30 seconds that I was meant to be going to York. After a very quick shower, a bite of a bacon butty and a quick be-sick-down the loo because of too many jagerbombs...we got in a taxi. By this point it was around 10:40am and our coach left Manchester at 11:15am and we still had to get to Manchester from where we live. I still had hope though! When we got on the tram I definitely knew I was still a little bit drunk because I was singing Vengaboys with an audience. Sorry about that. We got into Victoria Station at about 11:09am and realised we were definitely not making that coach so we headed to McDonalds to try and make ourselves feel human again and then I booked us some new tickets for 12:15pm. We got on the coach and my first thought was 'yay, plug sockets, I can Snapchat to my heart's content". Izzy gets travel sick so I was pretty worried on our first coach to Leeds because it was extremely rocky and even I kept thinking I would spew. When we got to Leeds we were both extremely grateful to not be on the road anymore and took this time to go and sit outside on a bench, pigeon-watching whilst we waited for our next coach to York. We also bought some crisps because we felt rough and needed to sort ourselves out. After arriving in York we had about a 10 minute walk to get to York Dungeons. It's really simple if you have maps on your phone to follow but otherwise you may need directions as we didn't see any signs pointing to where it is unfortunately! 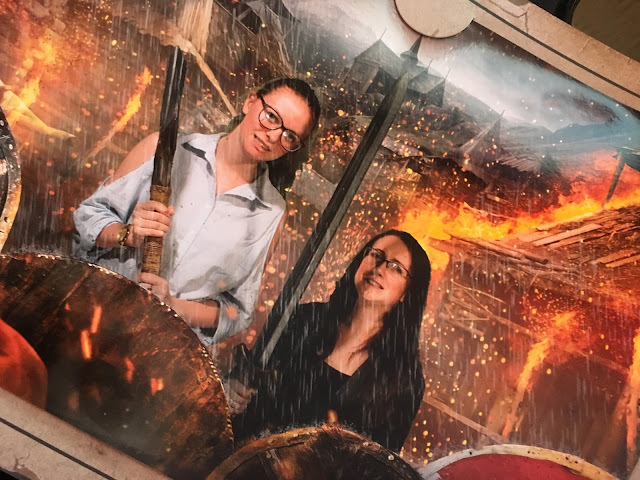 When we got there the first thing we got to do was be given a sword/axe and turn ourselves into a Viking by standing in front of a green screen and getting our picture taken. The first thing I realised is the staff there are so much fun and get into character straight away. You then went over to a guy in a lit up box where you can buy your tickets as well as sweets and drinks. You're then directed to go through to a very dark waiting area where you wait for a period of time for a group of people to form and then eventually it begins. I don't want to spoil the dungeons too much because it's better to experience it but you basically get led through the dungeons and be part of a story and you really get yourselves involved. I learnt so much about that period of time during that day! When it's all finished you get led into the souvenir shop where you get the opportunity to buy the photos you took earlier and also a large selection of goodies. After this we had about 20 minutes to get back to the coach stop so we practically ran through York. We were actually early so paid an extortionate price of £3.95 for a cheese and onion pasty. I know, you're right, that is bloody expensive. But there wasn't a Greggs. It started to rain so I couldn't eat it whilst we waited for the coach. So I was sad. Then we got on our "coach" which was actually a double decker bus and me and Izzy couldn't sit together so I still couldn't eat the pasty, otherwise I would've annoyed the girl next to me. Eventually though people got off and we were reunited so we ate our pasties together so I was happy again. When we got back into Leeds we had to wait like 30 minutes for another coach so we just spent this time chatting away in Leeds Station. The final coach was pretty easy and the time flew by. When we got to Manchester we were hungry so we made a pit stop to McDonald's and got a few things to nibble on (I'm talking fries and cheese burger) whilst getting on the tram home. That Mcdonalds was actually crazy. There are bars on the windows, they have security and when we went in some guy was kicking off. I mean I love me a cheese burger but I didn't realise people were that mad for a maccies. Finally we got home around 9pm (ish) and I was still hungry so I devoured the most amazing cheesy beans on onion bagels. This meal has always been one of my favourites because it's so simple and quick to make and as I was tired it seemed like it was definitely the best option for me. The moral of this story is don't drink jagerbombs or make plans on days that you're meant to stay in bed. **A special thanks to Branston Baked Beans and their partnership with Merlin Entertainments for this amazing opportunity! It was such a fun day out, I got to visit a new place in the UK and it cured my hangover. I would definitely recommend York Dungeons to anybody looking for a good day out.